While the Ottawa 67’s battled on the ice on Sunday afternoon, the Barber Poles family worked hard in the stands to help those impacted by Friday’s massive storm and tornadoes. 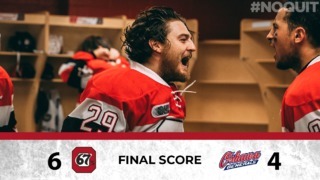 Though Ottawa would fall 7-3 to the Peterborough Petes in this one, the club, along with players from the Ottawa REDBLACKS and Fury FC, helped collect money for the storm recovery effort. 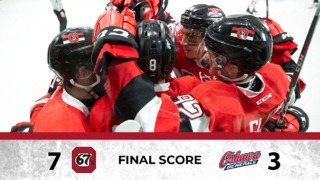 Meanwhile, the 67’s opened their doors to everyone for this game, with 2,000 people taking the club up on the offer of free admission with many still without power at home. Most in attendance contributed funds or articles of clothing to help those hit hardest by the storm. On the ice, Christopher Paquette’s hat trick included two shorthanded goals, and it was enough to help the Peterborough Petes secure the win on Sunday afternoon. The Petes’ penalty kill carried them to the victory in this one, as the Petes had four shorthanded goals in all. Peterborough’s offence began early – their first two goals came on their opening two shots of the game. Paquette’s first marker opened the scoring at 10:33, then Nick Isaacson extended the Petes lead to two just 55 seconds later. With the score at 3-0, the 67’s found a way back into the game. Austen Keating took a feed from Lucas Peric and buried his second goal of the season. Ottawa applied more pressure before the end of the period, but couldn’t bury any late opportunities. Matthew Maggio’s third period goal was the first of his OHL career. The 15-year-old rookie had 20 goals with the Sun County Panthers in minor midget last season. 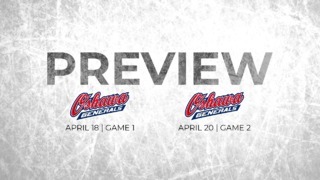 It was a day of firsts for players on both squads – Gloucester, Ont. native Cameron Butler scored his first career OHL goal for Peterborough. Despite losing the game, the 67’s offence directed 40 shots at Petes goalie Hunter Jones, coming up empty on 37 of them. Christopher Paquette’s two shorthanded goals was one off the franchise record for Peterborough (3), which was set by two separate players. The 67’s were -3 on the power play, with Graeme Clarke’s nifty deke standing as the home side’s lone power play goal in the contest.